As one of the Vermont artists invited to be a part of the Bennington Museum’s State of Craft show, I was able to schmooze with the other artists and guests at the crowded opening last night. I’m not a big schmoozer (kinda shy) but I was able to make a few real connections with some other artists that made the trip worthwhile. This show is an attempt to represent and honor the “studio crafts movement” in Vermont. The piece of mine that the curators selected was “The Spaces Between V”. 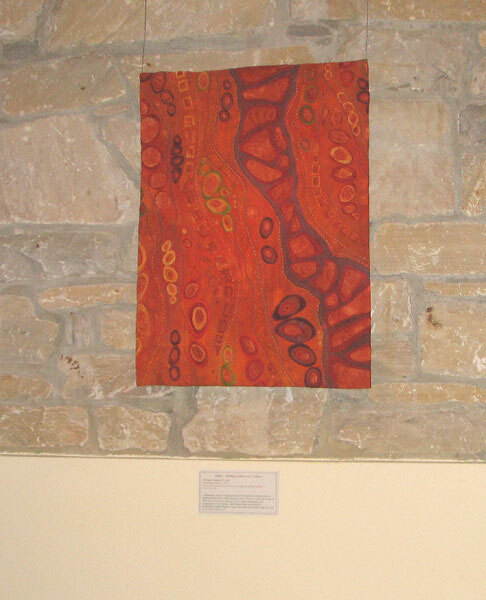 It was hung against a lovely stone faced wall. There was some amazing work here- fiber, glass, wood, ceramics and mixed media. The full size chaise lounge constructed of welded together quarters is worth the trip alone! I recommend it to anyone within range of southwestern Vermont. This entry was posted on May 23, 2010 at 3:02 pm and is filed under Exhibits. You can follow any responses to this entry through the RSS 2.0 feed. You can leave a response, or trackback from your own site.